Cue the Hovis music - eh up when I were't lad etc - I used to lay on the floor, surrounded by timetables, planning my days out. No complicated websites wanting to know your location, only showing you times from where you leave and where you're going to - never mind if you want to know how it gets there. Or demanding to be allowed to send you "exciting offers and news" or bombarding you with stuff you just don't want to know. Quickly checking up on a bus time is almost impossible these days. It seems I'm not alone in thinking this. One of the people I've been able to get to know through this blog is Roger French OBE, former MD of Brighton & Hove, which he reigned supreme over for 25 years. Now he spends his (very happy) retirement travelling the length and breath of the UK enjoying and commenting on public transport. He is one of the most respected people in the industry, and he just happens to be a bloody nice bloke too. Going under his trade name of Bus and Train User he has also started his own brilliant blog, which is linked to in the sidebar, but you can see by clicking here. 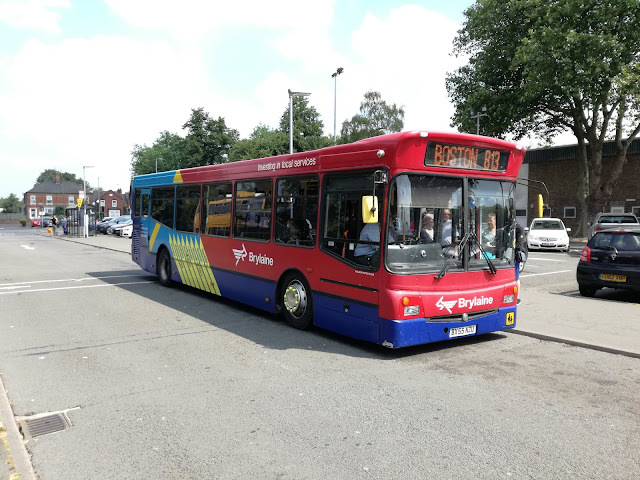 Last week Roger posted on the desire of some operators to be seen to be embracing modern technology but forgetting the basics, such as simple timetables and route maps. I liked the post so much I asked Roger if I could reproduce the post here, and I'm delighted he said yes. It's pleasing when respected members of the industry like Roger think along the same channels as myself, so enjoy his post, and I'm sure he'll be interested in any comments. Thanks, Roger! Open data? Let’s get the basics right first. We want a mobility ecosystem that delivers seamless intermodal transportation faster, cheaper, cleaner, more responsive and safer than today. This will be enabled by open data on fares and journeys across all modes – data that is available to everyone to access, use and share’. No, they’re not my words; it’s the “putting passengers first” vision spearheading the DfT’s grand Bus Open Data consultation launched at four roadshows around the country over the last couple of weeks. I just hope this latest craze for all things open and techy is going to be a lot easier to understand than that gobbledegook of a vision the two consultants, Deloitte and ODI, have cobbled together with DfT mandarins. It might sound good to wordsmiths, but it’s totally meaningless to me. They might want a ‘mobility ecosystem delivering seamless internal transportation’; I just want a bus map that shows me where all the buses go and easy access to timetables. In the old days you could pick up a bus timetable which would include lovely clear maps making it easy to work out how to get from A to B and maybe wander on to C too. There’d even be town plans showing bus stop locations and information about market days and other stuff. In the not-so-old days you could go online and find all that information even easier. Now vast bus map deserts are opening up across the country making it impossible to work out where buses go. London, Kent, Dorset, Somerset, North Yorkshire… the bus map desert list is getting ever larger. How ironic at a time when Open Data has become the latest fad! Those ever helpful timetable books are getting more and more hard to find too. I spotted Conwy Council still produce a lovely clear and helpful book so as I’m planning a few days in that lovely county next week I gave the public transport team there a ring and asked if they could send me one in the post. They weren’t sure if they could do that; nor whether they had any available. “They’re like gold dust” I was told on the phone, “everyone wants one but we only produce a few now”. Agggghhhhhhhhh! (I’m pleased to say one arrived in the post yesterday. Gold dust definitely). Everyone uses journey planners these days, I’m told. Well, that might work fine if you know there’s a bus from your A to your B and you have a pretty good idea approximately how often it runs; but what if you don’t know anything? What if you’ve just moved into a new area? 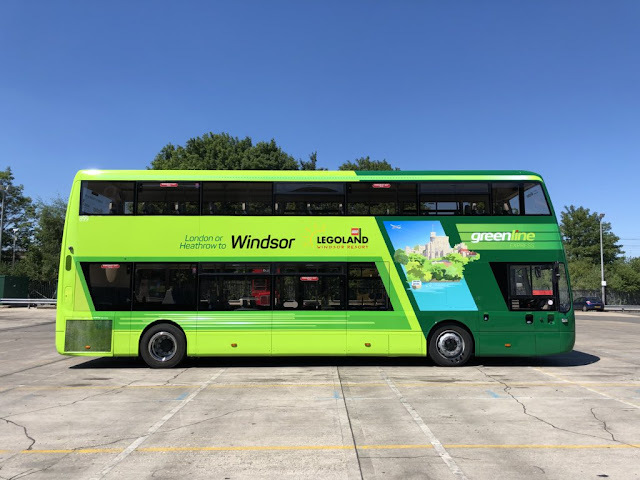 What if you’re wanting to be helpful to an environmentally friendly mobility ecosystem and take a car-free holiday using public transport for a week (having been convinced by Catch the Bus Week and all that)? Using a Journey Planner in such circumstances is like a game of Battleships. Try square B7 – has that hit a battleship or a cruiser? No, neither; you need square C6 for that, which if you’d had a map showing where they all were, would have been obvious. And come on guys, journey planners are totally robotic in their travel advice. Take my plans tomorrow. One of the routes I’m catching is split due to the ridiculous bureaucratic 50Km rule; it’s not actually split, just technically split, so Traveline thinks it’s two separate services instead of one through bus, and because the ‘connection time’ between the ‘two’ journeys at the split point is too tight it insists I need to catch a bus half an hour earlier to change on to the one I could have got at the technical ‘connection point’. A human being reading a timetable can work that out; a journey planner following pre-set algorithms can’t. There’s a classic in the Scottish Highlands where a once a day connection leaves Lairg station four minutes after one of the four a day trains arrives. Our helpful journey planner reckons such a seamless modal transfer needs more than four minutes so ignores it, instead insisting you have to make a two day adventure of a journey, yet there’s a footnote on the timetable that buses will wait for late running trains! But my biggest beef about journey planners is this. Suppose an infrequent bus departs at 8.50am and then at 11.30am. You optimistically put in your origin and destination and a desired start time of 9am. Assuming you’ve managed to pair up precisely the correct originating bus stop from a menu which can stretch to many alternative options (and the same with the destination) then it’ll tell you the only option available is a departure at 11.30am rather than suggesting starting out just 10 minutes earlier. You’re denied that option. It’s the greatest irony to see techy people salivating at the idea of soaking up data on bus fares and real time journey planners to develop Apps we never knew we needed when the basic rudiments of maps are being ditched by local authorities. Some bus companies are just as bad, by either not producing network maps or burying them so deep on their websites it’s like that illusive one square submarine yet to be found on the grid. The DfT’s grand consultation has a second strand to it; and that’s Accessible Information. ‘Talking Buses’ to use the more colloquial term. In her forward to the consultation document the Minister says “I think every passenger, regardless of where they travel in Great Britain should be able to do so confident they have boarded the correct vehicle and are travelling to the right place”. Well, hear hear to that. But hang on, why are we having to consider regulating bus companies to be doing something that is just so basic and should have been done as standard many years ago when the technology first became available. It’s not as though it’s expensive in the overall scheme of buying a bus which is going to last for the best part of 15 years and maybe more. Instead we’ve had boasts about virtually impossible to log-on to WiFi provision, faux leather seats that aren’t any more comfortable and splashes of silver or gold in the external livery from most Groups but a complete block on spending a couple of grand or so on something that really is useful and welcomed by all passengers as the Minister observes. She continues “with Regulations which focus on the information needs of passengers rather than the means of providing it, I believe we can encourage the change which is so desperately needed”. 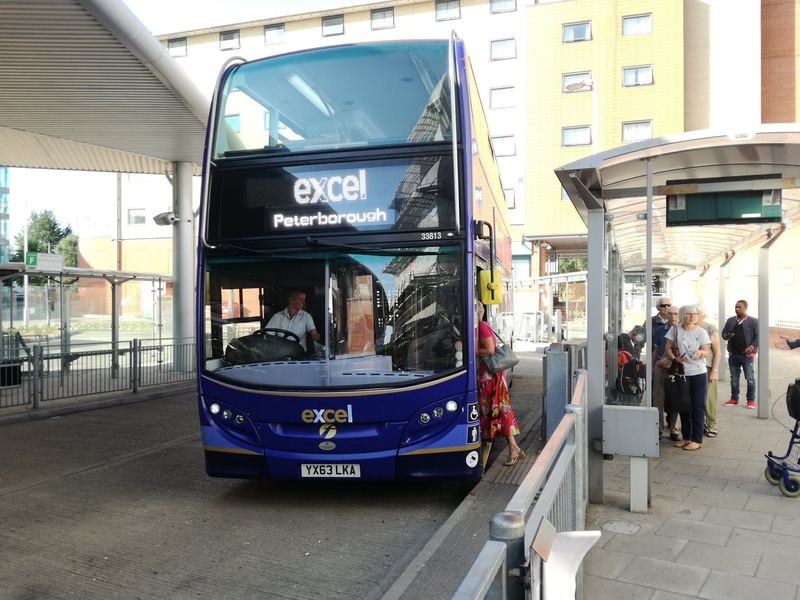 Commercial bus companies – change desperately needed by passengers – information needs ………………… Regulations. What a terrible indictment of a so called commercial industry which aspires to entrepreneurial freedom and baulks at regulation and franchising that we need Government to regulate for something passengers “desperately need” (and she’s right, us passengers do desperately need it …. and maps too please!). As some of you will know I recently had a mishap involving a hairpin bend and a field, which resulted in a requirement for a replacement car, though thankfully no replacement limbs. I wanted a similar car, and found one that caught my eye near Skegness in Lincolnshire. That's some distance from me, and when I saw the train fare I gulped. A single from Norwich to Boston, where I'd catch the bus from to the small village of Friskney, was £51. Yes £51! So I got my fare splitting head on (btw I recently co-wrote an article on fare splitting for the excellent Dawlish Beach website - to see the article click here), and by splitting the fare at Peterborough got it down to £29. Then I had one of those light bulb moments. If I had to get the bus either side of the train journey why couldn't I get the bus all the way? Turns out I could, so that is what I did. I started in Halesworth catching the 0631 Konect service 87 to Norwich, which goes via everywhere. 90 mins Halesworth - Norwich isn't going to encourage anyone, as was proved with only 5 passengers, including myself on the entire trip. However, it was one of the last surviving ex Anglian drivers I know, which helped. The Scania Omnilink, now 7 years old was ok and did the job. Arriving at Norwich on schedule it was time to switch to the XL, formerly X1, to Kings Lynn. My dislike for the E400's on the route is not a secret, and is the main reason I've rather neglected West Norfolk in recent years. Give me one of the old B9's any day. However, needs must, and soon 33813 pulled up on the stop, with a pleasant driver greeting everyone. One of my earliest gripes - ok moans about the E400's were the ridiculous route vinyls blocking the lower part of the top deck windows. So it's very pleasing to report they have finally gone, and it makes the world of difference. But I still don't like them. The driver couldn't have driven it any better, but numerous rattles, and whoever on earth designed that air chill system to give nothing one side and a howling gale the other needs putting in the stocks and pelting with rotten tomatoes! It was a very long hour and fifty minutes to Kings Lynn! 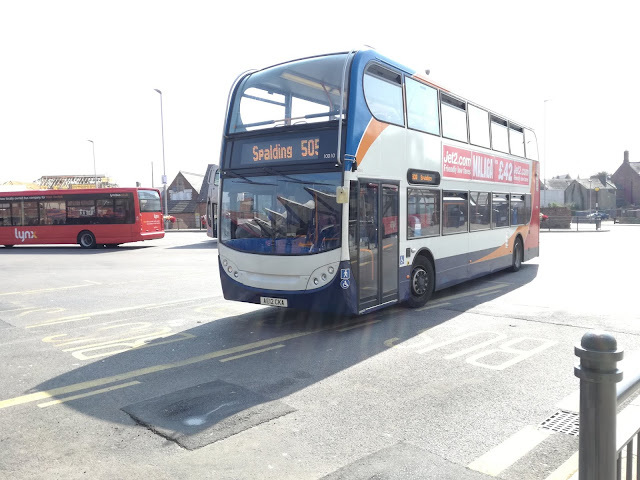 But arrive at Kings Lynn we did, and I transferred onto one of only 2 surviving routes still operated by Stagecoach out of the Norfolk town - the 505 to Spalding. Another E400, but this one had, in my view, far more comfortable seats, didn't rattle, and gave a better ride. Why this is I don't know, but there has to be a reason. Two things of note to report on the journey to Spalding. 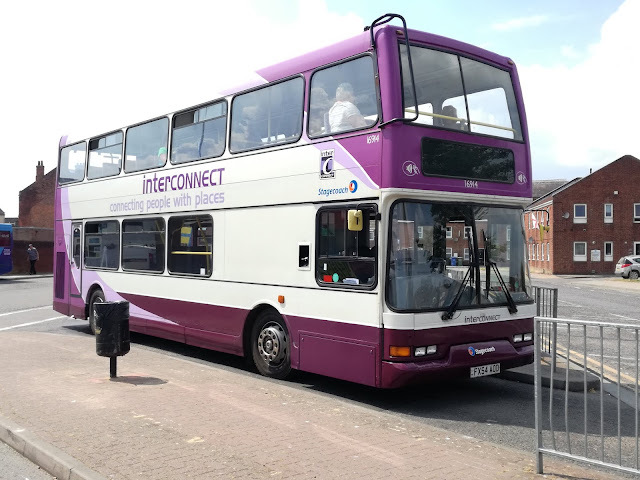 Firstly, it was good to see one of the original Norfolk Green 13 plate E400's operating the route, and secondly, in Long Sutton, arguably the sturdiest bus shelter seats I've ever seen. None of your flimsy narrow plastic balance beams here! 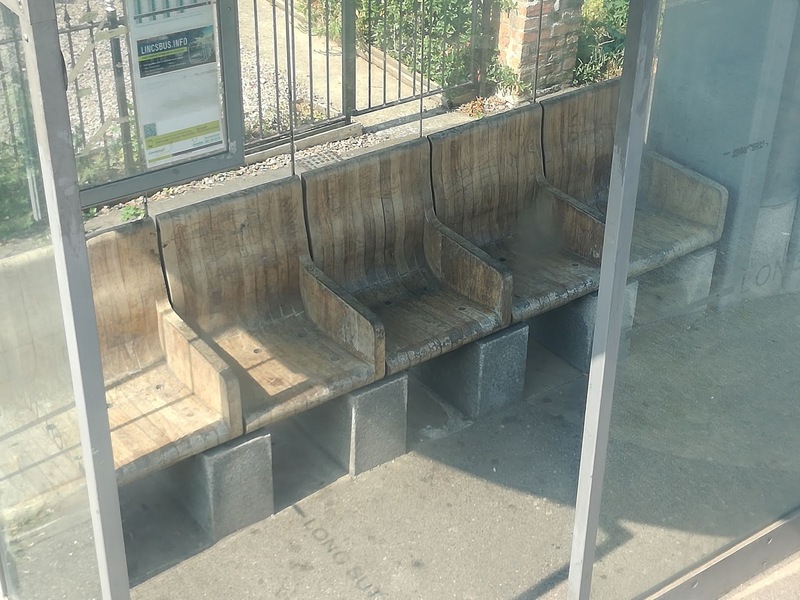 Now they are bus shelter seats! Arriving at Spalding Bus Station, still on schedule, I had one of those swooning moments. Parked up, obviously in service was an Ollie. Not just an Ollie but a Leyland Ollie! Was that my next bus? Please, please!!! Alas the 43 runs to Wisbech, and that wasn't where I was going. I was waiting for the Brylaine Buses B13 to Boston, and I certainly wasn't expecting what rolled in. I can now say I've been on a BMC Falcon, and I have to say I was extremely impressed by the quality of the body - to find a 13yo single decker with next to no rattles is a rare find indeed, so top marks for that. However, that's where the praise ends. The seats are woefully hard and uncomfortable, and the engine was making some alarming noises, including a perpetually screaming belt, not to mention some interesting smells. But it was a bus, and it took me where I wanted to go, and these days that's really all that matters. 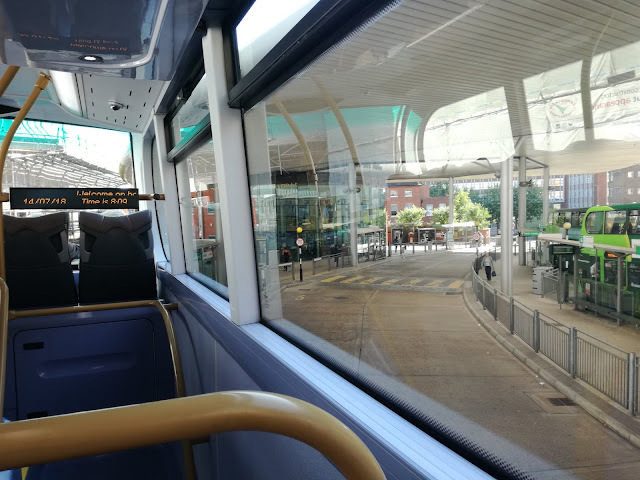 Lunch in Boston, which is a strange place with little evidence of town planning, and it was time for my final bus, the Stagecoach East Midlands Interconnect service 57 to Friskney. I had no idea what to expect, but a 14yo East Lancs bodied Volvo B7 wasn't top of my guesses. I have to say I love the livery, comfortable seats but more rattles than a 1930's football crowd! That, however, was overshadowed by the scenery, which I caught on a good day. I'm not sure I'd like to ride that route in mid January with driving ran and a howling northeasterly! Clearly the driver thought the same, as he told me he only drives in the Summer! So precisely 8 hours after leaving Halesworth we pulled up at my stop in Friskney bang on time, and as I stepped off the bus I could see my new car 10 yards away. Every bus ran, on time, and the connections were seamless. I can't fault the journey in anyway. Yes, of course I'm being churlish in criticising some of the buses, but that's just me. However, it did highlight one of the reasons bus travel is declining. Had I not liked the car I couldn't have got home by bus. Nowhere near, in fact. I know my journey was an extreme example, but it is typical of the way it is outside big towns and cities. You can get there by bus, but not necessarily home unless you leave at silly early times. 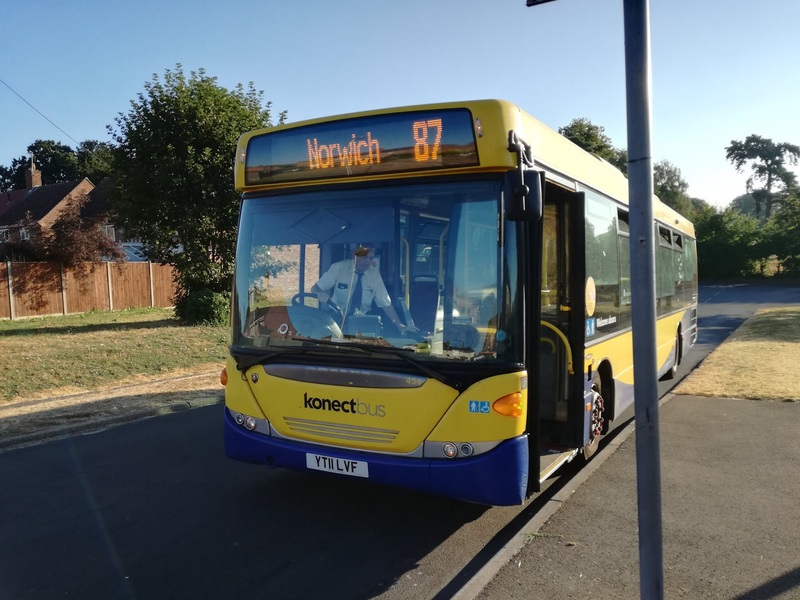 Take Southwold - the place has been packed in recent weeks, but if you fancy a day trip from Norwich the last Konect service to Norwich leaves at 1658, the last Borderbus service even earlier at 1645. Where is the incentive there if you have to start packing up halfway through the afternoon? 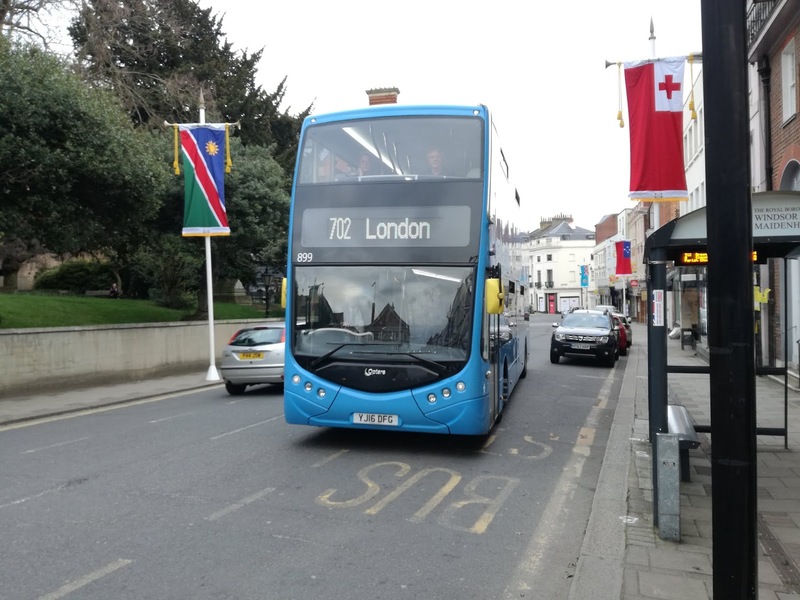 This issue really has to be addressed by both operators and local authorities if the downward turn of bus travel is to be reversed. Bus travel is brilliant, it really is, as Saturday proved, but if you can't get back without cutting your day short it's simply shooting itself in the foot. I received the following email from Ian Burke, telling me about his new website, which is a bit like Michael Portillo's Great British Railway Journeys, except by bus. And not on TV! It could turn out to be a pretty good resource for the most interesting routes in the country, and I wish Ian the best of luck with it. You can find the link in the sidebar. How's it going? I've just started up a new bus trip blog over at slowertravel.co.uk, which may well be up your street and that of your readers. It's not about buses, per se, rather it's more about getting out and about on a local bus and writing about the ephemera that I come across along the way. 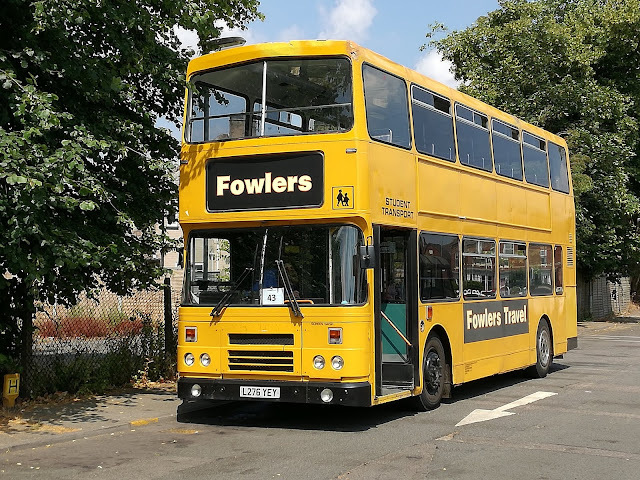 I'm based in Manchester, so I expect that the routes I cover will primarily be in the north west, although I will be exploring further afield when the opportunity arises. To be honest, the site is very much cobbled together at the moment, but I'm sure that I'll eventually figure out what I'm doing! I'm also on Twitter as @slower_travel. 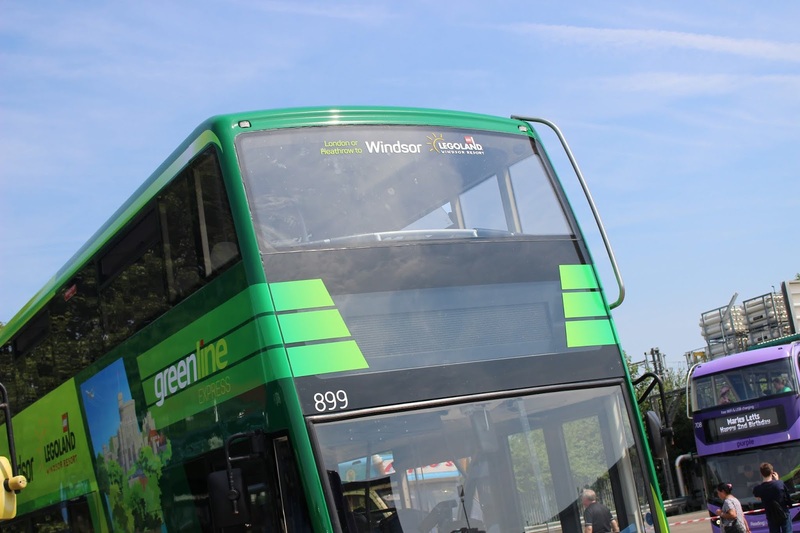 Long time readers will know that I was highly impressed by the Optare Metrodecker when Borderbus trialed it a couple of years ago, when Ipswich Buses trialed it, and most recently when Reading Buses tried it out on their Greenline 702 route. I wasn't quiet in my praise for it, and that I thought it was the best bus by far built in this country. 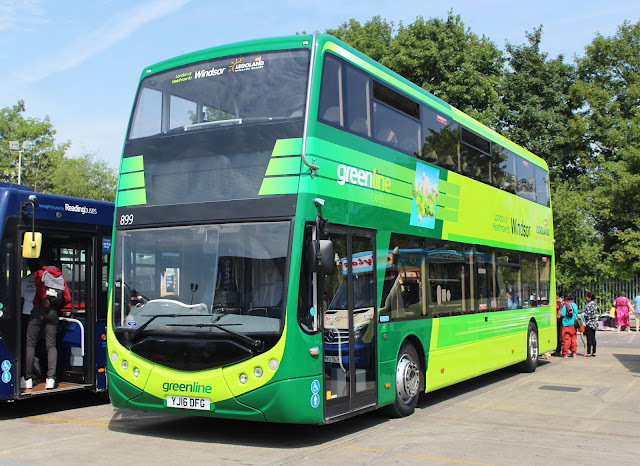 Well it seems Reading Buses agreed with me - their drivers certainly did - and they have ordered 5 high spec Metrodeckers for the route, which will be delivered next year. I also waxed lyrical over the BCI Enterprise which Reading Buses have also ordered 2 of, not for the 702, although it's likely they will be used in Legoland high season due to their greater seating capacity. 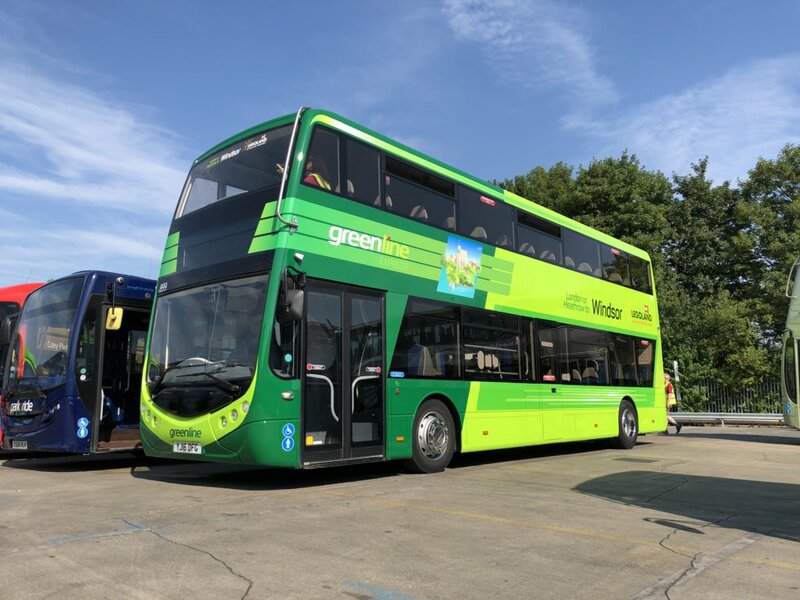 But this post is about the Metrodecker, and, on top of the Reading order, Transport for London have ordered 31 fully electric Metrodeckers as part of a 68 electric decker order which includes 37 ADL/BYD electric deckers, which will have the E400Citi body. I am delighted for Optare. 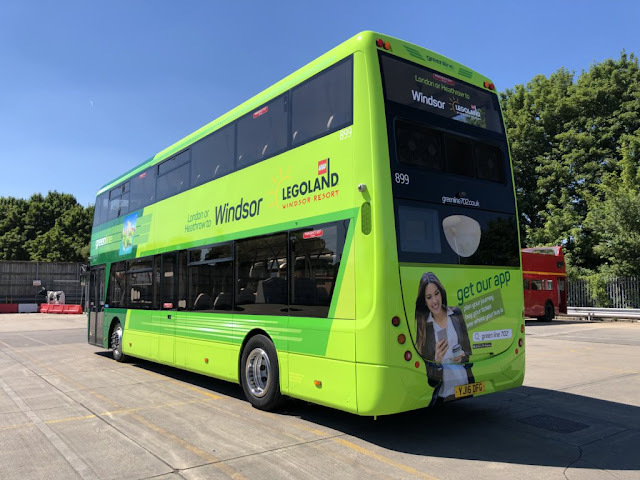 They have taken their time to develop this bus, listening and working with operators to ensure they produce a vehicle operators and passengers alike will use. I quite liked that blue livery, however now it looks very different. Reading have been loaned the bus long term while their own Metrodeckers are being built and she has been given the Greenline treatment, and wow she looks good. Unveiled at yesterday's Reading Buses open day I am grateful to DS Trains, Mangopear Creative, and the maestro himself, Martijn Gilbert for sending me pictures of 899 in her new glory. Cheers, guys! I hope this is just the start for the Metrodecker. The vehicle deserves it, as do Optare for not rushing it. Kudos to Reading Buses for negotiating the deal with Optare, and for listening to their drivers, not to mention the odd blogger - very odd in my case!